I have built at least 5 of them and I have never managed to get it right. I have used some “kitchen” recipes, that is: “Get a 300ohm ladder line, cut X centimeters here and there and solder the coax here and it will work.”. I have used M0UKD’s online calculator. Nope. It always tunes out of band. The 300ohm twin lead (narrow), the 300ohm ladder line (narrow) and the 450ohm ladder line (wide). I built several J-poles using the dimensions shown in my roughly sketched diagram. The antenna is measured with its top at 3m height. Maybe you have to adjust the resonant frequency by varying the top length. 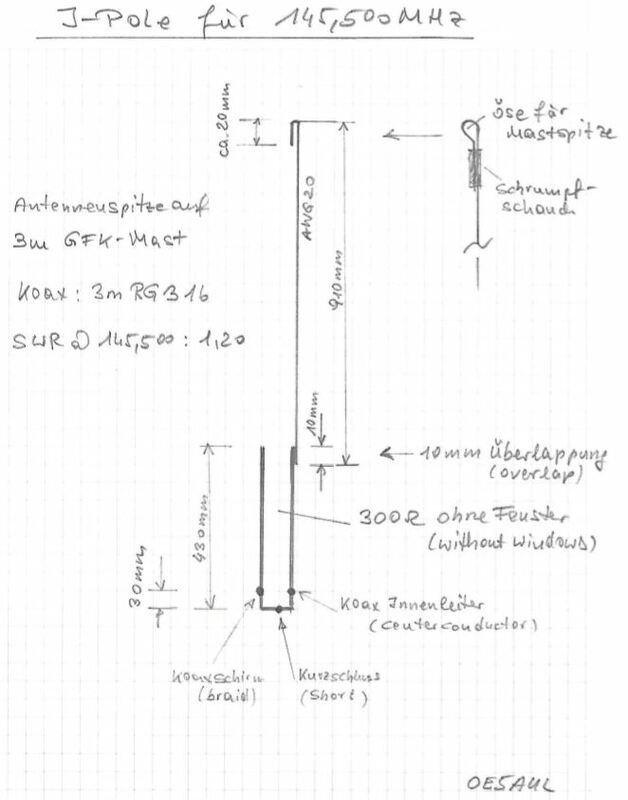 I can confirm that Peters J-Pole diagram works very well with the 300 Ohm twin-lead by DX-wire.de . One remark - and it might be obvious - I had troubles making a good J-Pole and the problem was actually the coax cable which was of poor quality. So a good coax (H155, or for lightweight: RG316 or RG-188) that is having low losses on 2m are mandatory to make it work properly. This afternoon I used solid black 300 ohm ribbon to make another one. The lengths were within a mm of the original and SWR 1,2:1 at 146 MHz. Good across all of 2 m according to my fancy analyser. If not putting in a radome and if you like rule of thumb, calculate a half wave using 300/f. Reduce this by 5% for end effect. Use a Vf of 0.81 if using 300ohm ribbon to find a half wave. Add a quarter wave equal to half the half wave giving 3/4 wave length of ribbon. Notch one conductor at the junction of the quarter wave and half wave. Bare the conductors 1 1/4 inches from the bottom and solder coax on here with screen to side of quarter wave that is cut. Short the bottom and top. Hang and test. You should be happy. 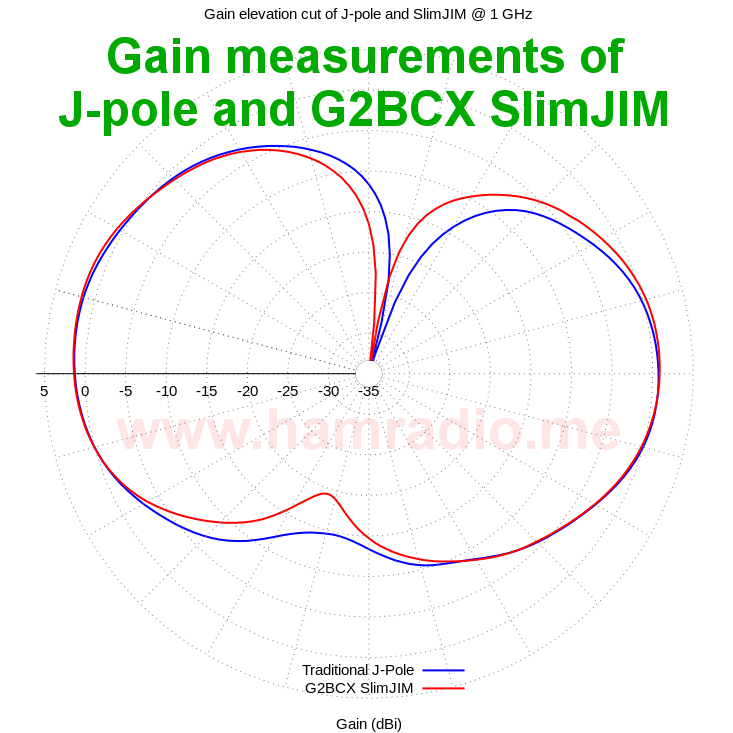 Note that a Slim Jim and a J-pole are different antennas. The Slim Jim is more compact. I made a Slim Jim using aluminium welding rod and trimmed it to resonance on 145 MHz but unfortunately I didn’t keep the dimensions. Thanks for the replies so far guys! There is a lot of black magic and myths around antennas. The reason why I want to slim-jim so much (as opposed to a J-pole) that various sources say that the lobes of the slim-jim are more “squashed” towards the ground, giving you more gain at low elevation angles. That it doesn’t radiate to the sky so much. 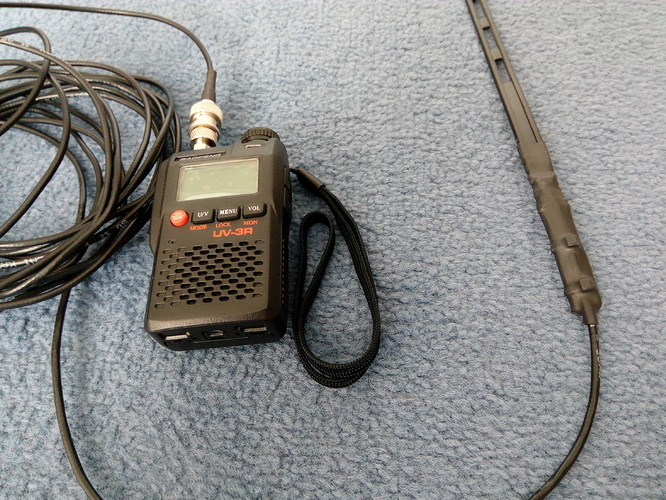 I’m using VHF in 2 kinds of situations: 1.) when my HF equipment fails or the conditions don’t allow for putting up an HF antenna 2.) for summits when carrying HF would be too difficult and VHF is actually more fun, that is, very high mountains in the Alps or Tatras. Especially for those QTHs the slim-jim looks like a winner to me. I feed them with H155 and hoist them up on a 6 meter high telescopic fiberglass mast. A Slim Jim and a J pole have essentially the same performance. This shouldn’t be a surprise, they are both half wave antennas. Working with twin-lead, I recommend the Ed Fong dual band J pole. That gives you 2 m and 70 cm in the same antenna. You can buy pre-made antennas from Ed or you can make your own. Scroll to the bottom of this page and he’s added links to the QST articles describing the antennas. That’s a great source that you’re linking to, Walter, thanks! In addition you could find a ready made one via eBay. 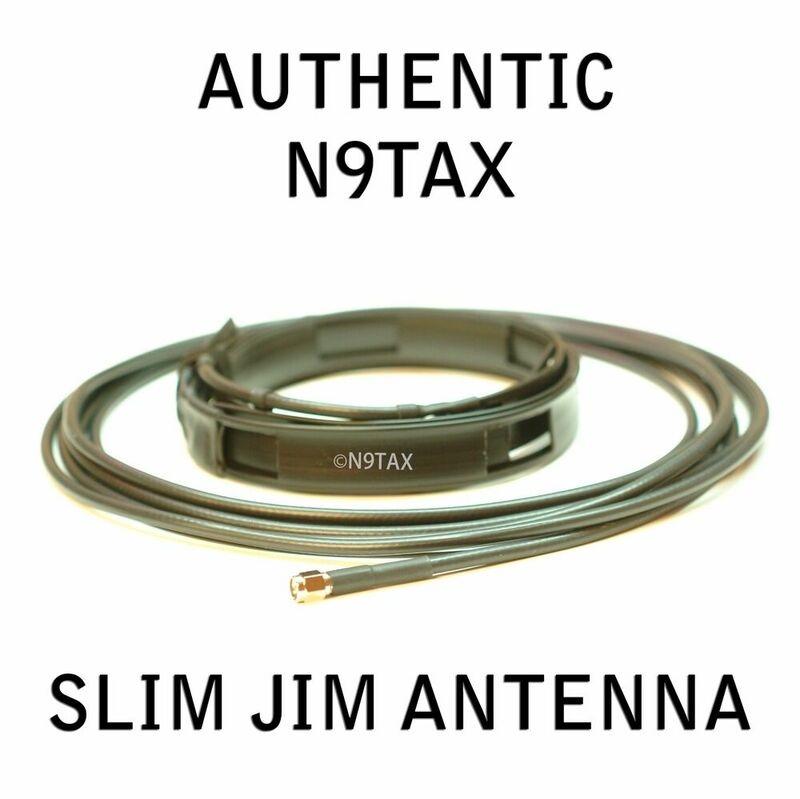 I've been producing these antennas professionally for nearly a decade now and have sold over 15000 units. Ferrite choke installed on cable. Antenna body approx 5' in length. Official antenna of the VA Special Olympics. | eBay! Sometimes I think that considering the cost of connectors, twin lead, coax etc etc plus of course your time, its better to just spring for a ready made $26 version! That looks like the same material David! Do you have the measurements please? Did you use a calculator or did you experiment and did the good old trial and error? I finally managed to get mine working. I had used the M0UKD’s online slim-jim calculator, but I had to add about 4cm to the top and about 2cm to the bottom part of the antenna. When I did it purely by the calculator it was tuning at 148+Mhz. You can get pre-built Ed Fong antennas, too. Ed points out that it isn’t easy to get the parts in small quantities, especially the good quality twinlead, so it is best to either buy one or have your club make a bunch and sell them. Don’t be fool by claims of dual band performance. 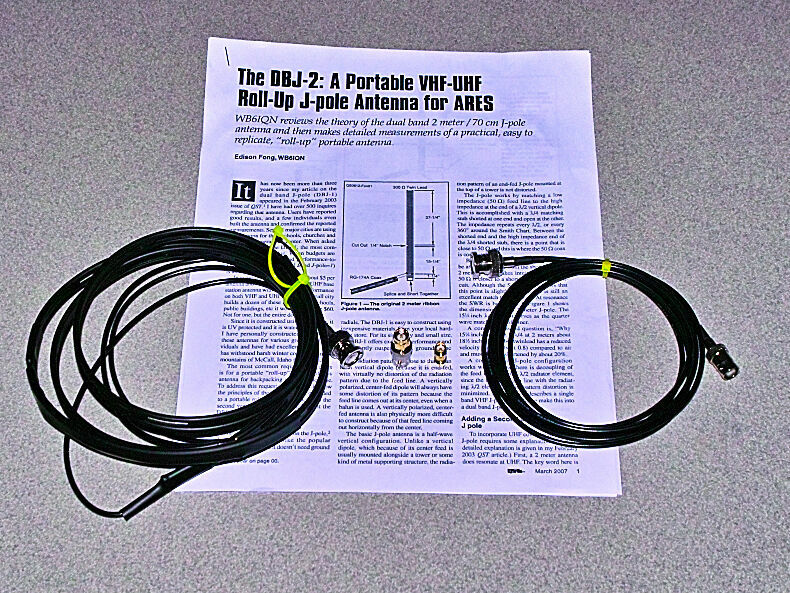 Although traditional VHF J-pole antennas will resonate at UHF, they suffer a –6dB loss at UHF over a ¼ wavelength groundplane. 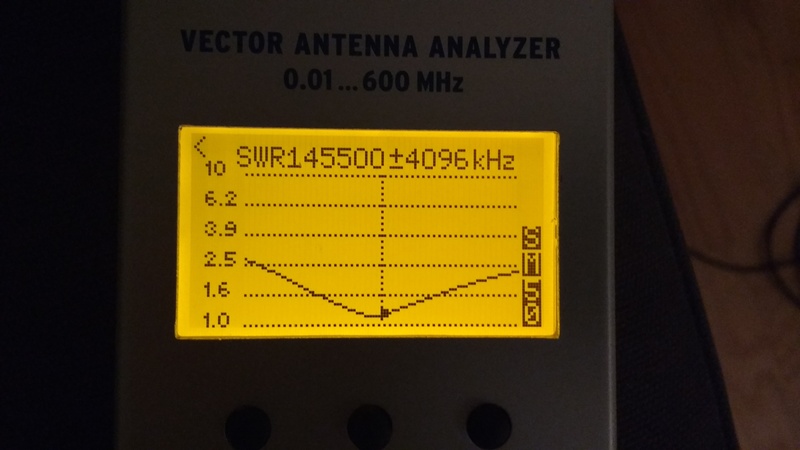 SWR is less than 1.3 to 1 on both bands. | eBay!